A Japanese tea house is a special building designed for holding Japanese tea ceremonies. It is built using simple rustic materials and is usually surrounded by a small garden called a roji. The garden has an important function in preparing the guests for the Japanese tea ceremony. Teahouses are generally small, and the floors are covered with tatami mats. These mats are made from tightly woven rice straw and have a covering of tightly woven rush grass that make a very smooth surface. The layout of the tatami mats changes according to the seasons. The Japanese do not wear shoes on tatami flooring. All thedoors and windows in the teahouse are traditional shoji, which are made out of thin strips of balsa wood and covered in translucent Japanese paper, which allows light to pass through into the room. The entrance to the teahouse is very low so that people must stoop in order to go through – this is a symbolic gesture of humility. 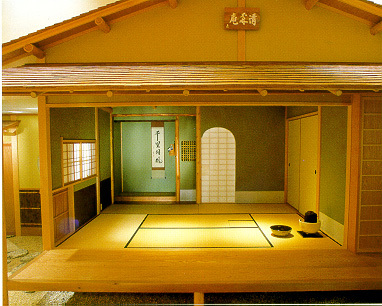 The teahouse generally has two rooms inside, the mizuya, for preparing the food, snacks and tea and for washing the utensils, and the chashitsu, for the performance of the tea ceremony. When the guests arrive, they are led into a waiting room, machiai, by the host's assistant, the hanto. Then they are offered sayu (hot water which is used for making tea). While they are here, the guests select one person to act as the main guest. The hanto then leads the guests into the roji. It is here that the guests “remove the dust of the world”. Then the guests sit on a waiting bench, koshikake machiai, and wait here until their host appears to greet them. Inside the teahouse there are no decorations except for a scroll painting, kakemono, which is hung in alcove called a tokonoma. This is carefully chosen by the host to make known the theme of the tea ceremony. Tea houses are often given a name by their owners. These names reflect the simplicity of the tea ceremony and the teachings of Zen Buddhism. Mayoor Patel is the writer for the website http://tea-party.tea-universe.com/. Please visit for information on all things concerned with Tea House. Copyright @ ChinatownConnection.com Houston Chinatown Portal. Traditional Japanese Tea House.